Thimbleweed Park Blog- Win! Win! Win! Again! 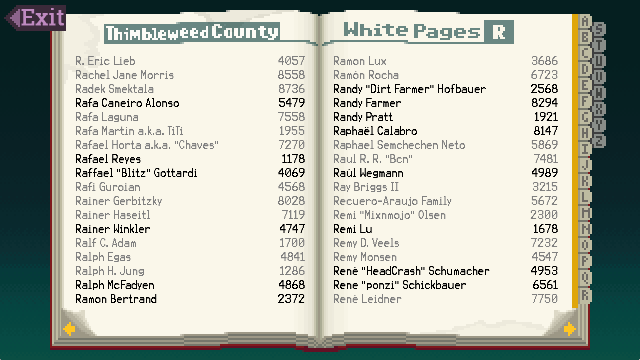 It's time for our second and last Thimbleweed Park phonebook contest. We're going to giving away another 5 entries into the Thimbleweed Park phone book, complete with (optional) voicemail message (but who wouldn't want to do that). This week, guess how many people are in the R section of the phonebook! The contest is open to everyone, even people who already have an entry. Five closest guesses get an entry in the phone book and the opportunity to upload a voicemail message. Ties will be resolved using officially sanctioned D&D combat rules (the D20). Post your guess in the body of your message in the comments section. The number must be on a line by itself. In order to win, you must fill in your email address in the email field. DO NOT put your email address in the body of the message. If you post multiple guesses, only your last one will count. We'll pick a winner Monday morning, live from Spain! Dang Ron, I now see even more weird cases where alphabetizing would be tricky. Sure, you could ignore strings in quotes and "a.k.a." but what about the one where the last string is "Family"? I know it's going to bug me from now until the end of time, but it is what it is. Rock on! 85, if you include "Ron"
Can I invite you for a dinner? Sorry, I thought you wanted to know the number of people with a voice messagen, not the complete number. So my corrected answer is 35. This sounds to obvious. I think he picked it because it's the 13th letter in "nineteen hundred eighty-seven"
0-0 I am hyped to see who wins! That's great! I've been waiting for someone on this blog to comment that they see their name on these screenshots! I think you are the first. Hello Caller. This is Markus Weber. Iam very sorry but i can't respond your call at this moment. A damned, slimy meteor has crashed into my lovely apartment. Look at this mess. All is devastated.Oh man. Please leave your name and your number after the signal. I will contact you as soon as i removed this snafu. Is it purple slime? Then better don't touch anything and call the Meteor Police! no "Ransome the clown" in the phone book? He did not even lose his private jet but also his telephone and answering machine! Well actually during his active years he was living in a trailer, travelling the country with the circus. Do you think those trailers have mobile phones?? How could something like this ever be possible? That's crazy talk!